Crystal Palace (0) : -. Man Utd (2) : R.v.Persie[(pen)62'], W.Rooney[68']. Speroni, Ward, Dann, Delaney, Parr, Puncheon, Jedinak, Ledley, Ince, Chamakh, Murray. Substitutes : Hennessey, Gabbidon, Dikgacoi, Bannan, Bolasie, Gayle, Jerome. De Gea, Smalling, Vidic, Ferdinand, Evra, Carrick, Fellaini, Mata, Rooney, Januzaj, van Persie. Substitutes : Lindegaard, Valencia, Fletcher, Giggs, Kagawa, Young, Hernandez. 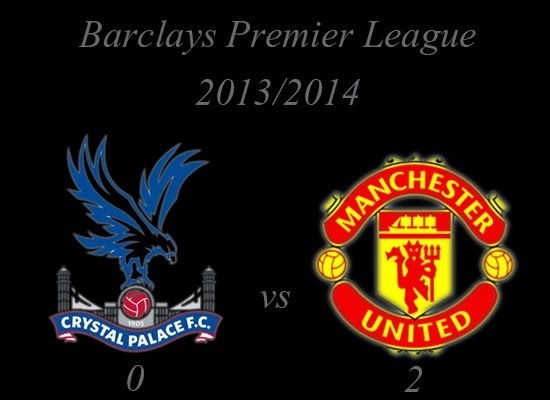 How do you think about Barclays Premier League : Crystal Palace vs Manchester United?